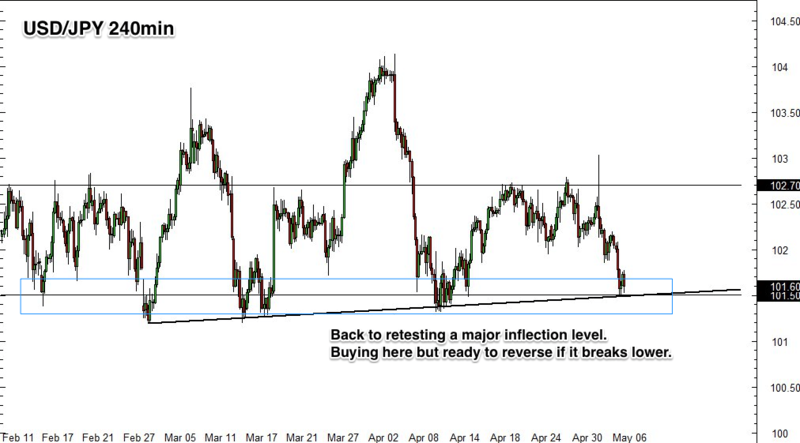 The Greenback has taken a big hit this week, sending USD/JPY to retest a major support level. An opportunity for forex bulls to buy? The 101.50 area has been a rock in terms of holding off sellers all year, but with such a bearish reaction to the most recent NFP report, could it be time for it to break? To be honest, I don’t know–who does really? But right now, the market is holding this area pretty well for the last four 4-hour candles, indicating that this psychological area could keep the streak going and be a buying opportunity. And looking ahead on the forex calendar, it looks free of major U.S. or Japanese economic data, so the technicals have a good chance for being a strong influence for the rest of the week. I’m only risking 0.50% of my account on this one, and with this trade structure, I have a potential reward-to-risk ratio of about 1.57:1. Of course, anything can happen in the forex markets, so if the economic or geopolitical story changes I’ll be sure to reassess and adjust quickly (possibly a position reversal if the catalyst is right) if necessary. Also, I’ve still got AUD/JPY on my watchlist and the Austrlian Jobs Report could potentially take it down to levels that makes it interesting to jump into. Stay tuned by following me on Twitter and Facebook!